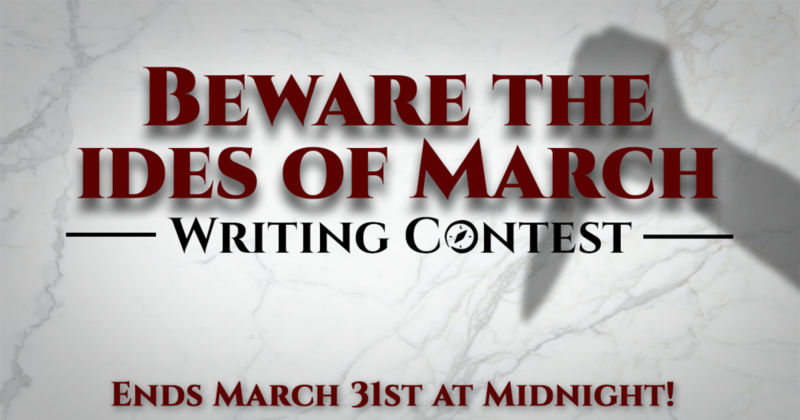 Expedition Writing Contest: Beware the Ides of March! We just wrapped up our last contest, Beasts and Blizzards, and its been a couple of weeks. That means its time to sharpen those tongues and plot devices, as our next contest Beware the Ides of March is here! Whether its a political overthrow, manipulating or brokering peace/war between nations, or being stabbed in the back by one of your travelling companions at the end of your hard-fought adventure, intrigue and betrayal make for some captivating stories and plot twists. Inspired by the words Julius Ceasar that he foolishly neglected, we want to see your best quest involving tales of intrigue or an element of betrayal. As you can see, we're taking a break from our dual-theme, but we'll still be rewarding participants with 100 points for entering a valid quest while the winner will be awarded 500 loot points total. Just publish your best quest by March 31st at 11:59 PM (EST) to qualify! Your quest must be in English to qualify, but we do encourage quests of all languages to be made for, it just takes us too long to translate in a reasonable time to make a ruling on a winner. Finally, make sure your quests are marked for your audience accordingly, anything offensive will be taken down and the entrant disqualified. While we do reference some pop culture in our inspirations, make sure to not use anyone’s intellectual property other than your own! Create your quest and upload it by March 31st, 11:59 PM (EST). Make sure to check out he master list of Vault and Forge entries for some blog posts that might help hone your quest crafting abilities! Keep an eye on our social media, as we'll have some posts to help our authors with any ideas throughout the next two months. If you're looking for some tips on creating quests, check out our Quest Crafter series and consider subscribing to our Quest Crafter newsletter for more like the ones we referenced above! Make sure to follow our Facebook, Twitter, and Instagram pages for the latest updates, and join our community on Reddit for the latest announcements, as some of our posts in the weeks to come might help you in your quest creation. Best of luck to you, adventurers! After a successful Kickstarter and contest, Stories of the Stars, the team decided to hit the drawing board again. Now that we’re back in gear, we’re excited to unveil our next contest. 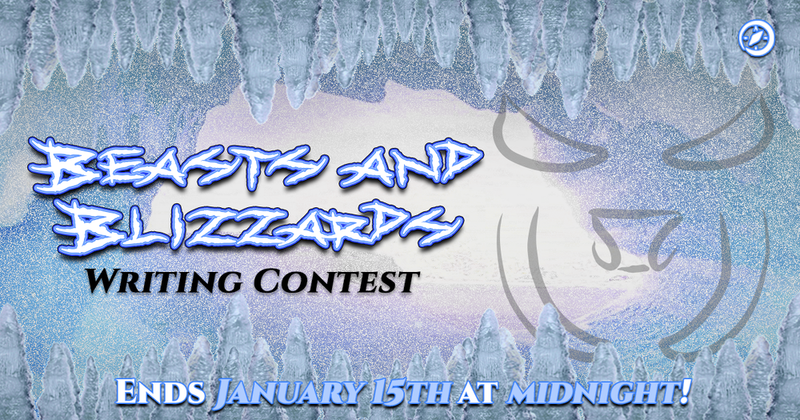 Put on your best winter coats as its about to get chilly…Beasts and Blizzards will be our next writing contest! Beasts and Blizzards will see the return of our popular dual-theme system, with the themes being beasts and winters respectively. In other words, we want to see you publish the best quest you can using either beast enemies, winter as a seasonal background, or both if you’re up for a challenge. This contest will run until January 15th at 11:59 (EST). The winner of Beasts and Blizzards will be rewarded with 500 loot points total. All other entries will be rewarded with 100 points for using either theme, or 200 for using both. Feral beasts are often common foes in RPGs, but it takes a special writer or GM to make these foes real characters in a campaign. Maybe your story will feature an owl-bear hybrid monster? Perhaps a giant spider endangering an intrepid duo of halflings? Or even just that giant rat in your favorite innkeeper’s storage closet? There’s tons of examples in common stories, tropes, and adventures to give you inspiration! Making your quest involve Winter as a seasonal background could mean a lot of things. Its easy enough to just write it in the background and have some talk of snowfall, but settings deserve just as much character as the leading hero! Seasons care not for the adventurers’ needs (unless you have a handy Druid that can change that) and can be cruel and unforgiving as a result. Whether its forcing heroes to take longer during their travels, endangering their food rations, or bombarding them with snow, hail, or avalanches, there’s a lot that can be done! If you combine these stories, you can even create some festive quests and re-skin some enemies, such as the Troll, to a certain Germanic folk villain or even another creature, like the Ice Yeti. Maybe a Riftwalker could be utilized as Snow Elementals that sing tunes and narrates the adventure? We can’t wait to see what you come up with! You can also check out these Vault entries for inspiration and help! To enter, all you have to do is publish a quest by 11:59 PM (EST) on January 15th. Your quest must be in English to qualify, but we do encourage quests of all languages to be made for, it just takes us too long to translate in a reasonable time to make a ruling on a winner. Finally, make sure your quests are marked for your audience accordingly, anything offensive will be taken down and the entrant disqualified. While we do reference some pop culture in our inspirations, make sure to not use anyone’s intellectual property other than your own! Create your quest and upload it by January 15th, 11:59 PM (EST). Expedition: The Future & Deluxe Edition is now live on Kickstarter, and has already funded within the first day of launch! From here on, we’re working towards some awesome stretch goals (like some new quests.) While many of you probably know the details of the Kickstarter so far, we’ll go over them real quick here. The Future is the second expansion to Expedition, bringing along new enemies, abilities, and loots cards inspired by science fiction. We’re also introducing a brand new skill check mechanic! Skills allow for a new layer for roleplaying and combat! When you level up, you can choose to draft a card or level up a Skill, which helps you do better at checks both in combat and in the story. It also becomes a powerful, single-use ability that scales with the level of the card! Tech abilities add a new combat style. You can use Tech with loot to help your team and get the best of your enemies, unlocking powerful synergies with the existing abilities. Synth enemies are mechanized creatures that you will encounter in many future quests. From the lowly Repulsor Probe to the heavily-armored and ever-hungry Cyclonic Digger, the selection of new enemies offer loads of exciting new storytelling directions. Alongside The Future, we’re introducing Expedition Deluxe Edition! This package includes Expedition, The Horror, and The Future — allowing for a complete collection in one convenient box. We took your feedback to heart, and have added art to all the previous enemy cards, upgraded cardstock quality, and designed new (and improved) clips that protect the cards. There’s even room for sleeved cards within this box and future cards/expansions! We’re very excited for this Kickstarter, and we hope you are too! Our backers are doing an amazing job of sharing on our social media, and if everyone keeps it up, we might be able to unlock some sweet, sweet stretch goals. So keep posting, tweeting, and telling your friends all about Expedition! Expedition: The Future | What's it about? Tech abilities use loot to help your team and get the best of your enemies. You can also look forward to new adventurers that enable awesome synergies with the existing ability types. Synth enemies are new robotic foes that can be used in a variety of settings with mechanics that center around loot and persona. Whether they're storing loot or running down your moral, these enemies will be a fearsome addition to the enemy lineup. Skill checks are a staple of D20 systems. Many quest writers have built their own skill systems to fill the void... but now we’re building them into the system. Players can level up and learn skills to do better at checks both in combat and in the story - or use their skills’ powerful single-use ability to get out of a tight spot. These new cards will be sure to add a lot to your games of Expedition, so keep your eye out for the Kickstarter on October 2nd! We'll be offering the Deluxe Edition of Expedition alongside The Future! This will allow newcomers to jump in on Expedition to get Expedition, Expedition: The Horror, and Expedition: The Future - including art on all base game enemies. The Deluxe Edition and The Future will also include upgraded card stock and custom-designed Expedition clips so that your new cards won't get scratched up! Worry not! The larger box and custom clips will also be available as add-ons. These are just some of the things you can look forward to our Kickstarter launching on October 2nd! Make sure to follow our Facebook, Twitter, and Instagram pages for the latest updates, and join our community on Reddit and Discord for the latest announcements and to meet other players! Expedition has a whole slew of announcements for July, from more details about our sci-fi expansion to the launch of online multiplayer in Expedition, there'll sure to be something for everyone. We hope you're excited for the future of Expedition as much as we are! Last month the Expedition team (Todd, Scott, Logan, Greg, and Gabbie) were at Origins Game Fair 2018 in Columbus, Ohio! We kept ourselves busy with plenty of demos during the day, and even playtested some of the sci-fi expansion in the evening. In addition to that, we're excited to announce that our Sci-Fi expansion is planned to come to Kickstarter this fall. There also might be a piece of art tucked away at the bottom of this newsletter. Origins was an amazing show for us, and will be coming back in 2019. We'll be looking forward to seeing more of you next year! A little over a month ago, we asked our quest creators to create the best contest using progression through character, mechanical, or storytelling elements, and/or have the adventure take place in an educational institute of some variety for our writing contest, Adventures in Academia. Without further ado, we want to announce the winner of Adventures in Academia to be...The Illyrie Academy for the Arcane by Josh K! Thank you to all our participants, once again. Keep an eye on our website and social media, as we plan on announcing the next contest soon! Online Multiplayer & New Features! We've fixed a couple of bugs, and even added some new features to the app. Which also Includes the huge announcement that Expedition's Online Multiplayer feature is live! Online Multiplayer (previously "Remote Play") out of experimental! Check it out in the Tools section. At the start of the combat timer, flash the class icon of one of the enemies in the fight to increase immersion. (*) We wanted to take a moment to make a shoutout to Eric Zittel, for all he's done for the Expedition app! If you've been using the search engine in the Expedition app or have seen the official and award-winning icons next to quests, he's the one who helped make it happen. If you want to contribute like Eric, you can always check out our GitHub. With the recent introduction of Multiplayer in Expedition, we figured our players might want a place to meet other Expedition players and creators. Whether you're looking to game with others, talk about quest crafting, or just chat about all things Expedition, come join the Expedition RPG Discord Server! Don't scuttle past this part, our first baddie for Expedition's Sci-Fi expansion is ready to make his debut! Our chief illustrator, Chris, has been drawing the Expedition art on a few livestreams over the past couple of weeks. If you're interested in seeing enemies like the Scuttler get drawn, go ahead and give him a follow on Twitch and Twitter. Adventures in Academia is our next contest! It seems a lot of our previous entrants are fans of the new dual-theme system, so we'll be implementing that yet again. As school is just getting out, we figured it'd be fun to design a quest around that. We want to see you publish the best quest you can in an educational institute of some variety, show off your best progression through character, mechanic, or storytelling elements, or use both if you're up for a challenge. The contest will run until June 29th at 11:50 PM (EST). The winner of Adventures in Academia will earn 500 loot points. 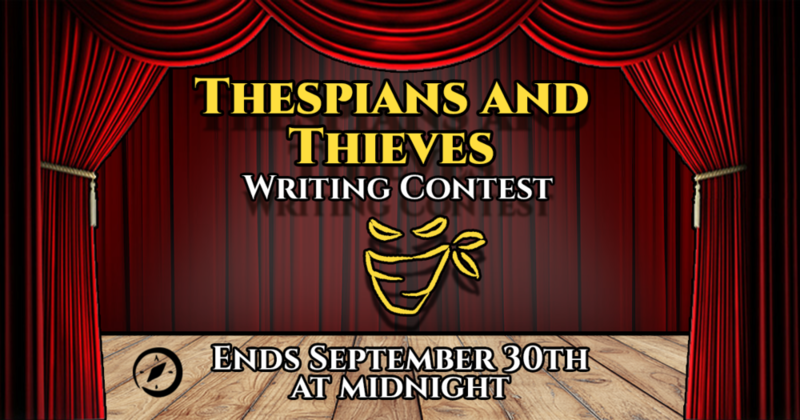 All entries will be rewarded with 100 points for using either theme, or 200 points upon using both. Are you striving to write a high fantasy tale, involving a school of mages and their character development over their attendance at said school? Maybe you're being trained as a paladin, in faith and steel, to protect the lands you live in? Or perhaps you're a fledgling gladiator, fighting your way to freedom while learning some new fighting moves along the way? We can't wait to see what you come up with! To enter, we're going to ask you to fill out this Google Form, with your name and quest title, to allow us to filter through quests easier. We're also sorry to impose a language restriction, as unfortunately, it takes too much time for us to translate foreign quests in a reasonable amount of time. We still encourage everyone, of all languages, to write and publish quests for all of our adventurers around the world. Perhaps in the future we can expand our efforts to including more languages for judging. In addition, make sure your quests are marked for your audience accordingly. Anything offensive will be taken down and the entrant disqualified. Create your quest and upload it by June 29th, 11:59 PM (EST). Fill out this Google Form, with your name and quest title. School's back in session, adventurers! Break out that parchment!